The PT1701MX 17" touch screen monitor is perfect for retail, point-of-sale or kiosk environments and is easily integrated with a variety of POS, thin client or PC systems. The touch screen requires human touch to activate and continues to work with liquids or other contaminants on the screen. The user can also easily adjust the monitor from -5 degrees to 90 degrees based on preference. 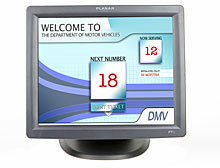 OSD buttons are located on the side of the monitor to minimize setting changes and can also be locked for customer-facing applications. No drivers are needed for basic touchscreen operation, but for advanced features, drivers are quickly and easily loaded. The Planar 997-4160-00 is also known as 997-4160-00	or 997416000	.